For some years now we’ve been hearing about a “crisis” in Iranian cinema: “When we don’t have enough movie theaters, why do we produce so many films?” But each year the number of films increases, as does that of firstor second-time filmmakers (this year sixteen young directors made their debut). We blame satellite dishes and popular television series for the lackluster boxoffice showing. We feel that the DVD black market, with as many vendors as there are sidewalks in Tehran, offering a variety of films uncensored and as cheap as $1 per film, is choking Iranian cinema to death. When the Fajr Film Festival arrives in late January, however, everything changes. This festival is the Nowruz of Iranian cinema. Not unlike the arrival of the Persian New Year, we forget our social and economic preoccupations to celebrate the event with pomp. Here, in the middle of winter, Iranian cinema wears a new dress, and all its producers and filmmakers and viewers celebrate that which they mourn throughout the rest of the year. Wherever you find yourself in the megalopolis of Tehran, you will be bombarded with street, television and newspaper campaigns that summon the spirit of Fajr. Fajr Festival 2006 was the first festival under a new president and his administration. Cinemagoers were curious to see how the event fared with the Ahmadinejad administration in charge. But, other than the usual propaganda, nothing else was brewing. Last year, too, the administration announced that it would financially and morally support “spiritual films.” No one knows, of course, what criteria define such films. It is perhaps not surprising, then, that most of the entries dealt with such topics as betrayal, lust and love, none of which has anything to do with “spirituality” as I understand it: Yek shab (One Night), Chaharshanbeh Suri (Fireworks Wednesday), Havoo (The Second Wife), Asr-ejom’eh (Friday Afternoon), Bagh ferdows panj-e ba’d az zohr (Bagh Ferdows, Five in the Afternoon), Qatl on-line (Murder Online),_ or Asb (Horse). Even though lines outside movie theaters dwindle with each passing year, worthy films bring in their own crowds, complete with black-market ticket sales. Films made by directors such as Jafar Panahi, Ebrahim Hatamikia, or even Asghar Farhadi, or movies in which stars appear, are sure bets. Also, the number of screenings for Iranian films (far more than the typical two or three screenings) is a boon. When a film is good, there is time to spread the news. Fajr Festival attendees have become more savvy: they can detect what film in the festival will be removed from the screen later — either for political reasons, like Jafar Panahi’s Offside, which shows how the ban on the presence of female football fans in stadiums plays out, or for not being commercial enough, like Shabaneh (Nocturnal),by Omid Bonakdar and Keyvan Alimohammadi, which movie theaters will not touch because they assume that their seats will remain vacant. More than ever in post-revolutionary Iran, entertainment is the name of the game as movie theaters are encouraged to make money and do not rely on government subsidies. But, the Fajr Film Festival is still a place where we can see fugitive films. In the seven-person jury of the Iranian section of the festival, the name of at least four “film spiritualists” could be seen, the most famous of which was Majid Majidi. No wonder, then, that many awards went to like-minded directors — including the Best Film for Be nam-e pedar (In the Name of Father), directed by state-lauded filmmaker Ebrahim Hatamikia, whose film last year, Be rang-e arghavan (In Purple Color), is still in quarantine because it dealt with the personal life of an Iranian intelligence officer. What was interesting, however, was that this very same jury recognized several countercurrent films: the urban drama Chaharshanbeh Suri (Fireworks Wednesday) by Asghar Farhadi, which paints a bitter picture of urban life in modern-day Tehran; Be Ahestegi (Slowly) by Maziar Miri, which attacks misogynistic beliefs and practices; or intellectual and minimal films like Kargaran Mashghul Be Karand (Men At Work) by Mani Haghighi or Asr-e Jom’eh (Friday Evening) by Mona Zandi. This jury even awarded a prize to the child actress of Havoo (The Second Wife), a hackneyed comedy by Alireza Davudnezhad in which a married man marries again, flirting with a third. Stranger yet was the Best Actress Award going to Hediyeh Tehrani, who, a few years ago, caused religious types to boil over when she was to play the role of Ayatollah Khomeini’s mother in a movie by Behruz Afkhhami. Nevertheless, the first film festival under Ahmadinejad’s watch gave its prize to her,though she was not present to receive it when her name echoed in ceremonial Vahdat Hall. While until a few years ago, all Iranian films that hoped to be screened during the year had to make a show at Fajr,this year, Iran’s most famous female film director, Tahmineh Milani withdrew Atashbas (Ceasefire) from the festival entirely and quietly screened it a few months later because she couldn’t get her latest — an Iranian version of Mr.and Mrs. Smith deploying two megastars (Mahnaz Afshar and Mohammadreza Golzar) — past the selection committee for the competition section.With revenues exceeding a million dollars in Tehran alone, Atashbas has broken all sales records. The public screening of Atashbas is a unique phenomenon not only at this particular juncture, but also in the entire history of the Islamic Republic. The ramifications of President Ahmadinejad’s election were uppermost in the minds of non-Iranian visitors to this year’s Fajr Film Festival. Would we find a rapid return to the more conservative elements that had epitomized Iran in the early nineties, or would the decrease in state control — most directly in evidence during the period of Ayatollah Mohajerani, President Khatami’s Minister of Culture, who spoke openly of the need for artists to pursue their art unfettered — continue? To all outside appearances, little had changed, with most film-industry practitioners resolving to simply wait and see. A reassuring vitality was in evidence among a number of films presented for international film festival programmers and other industry personnel. Among them were Berlin competition entries Jafar Panahi’s Offside and Rafi Pitts’ Zemestan (It’s Winter). Maziar Miri’s Be Ehestegi (Gradually…) and Nasser Refaie’s Sobhi Digar (Another Morning), both second features for promising young directors, also went on from Fajr to screen at Berlin, in the Forum and Panorama sections respectively. 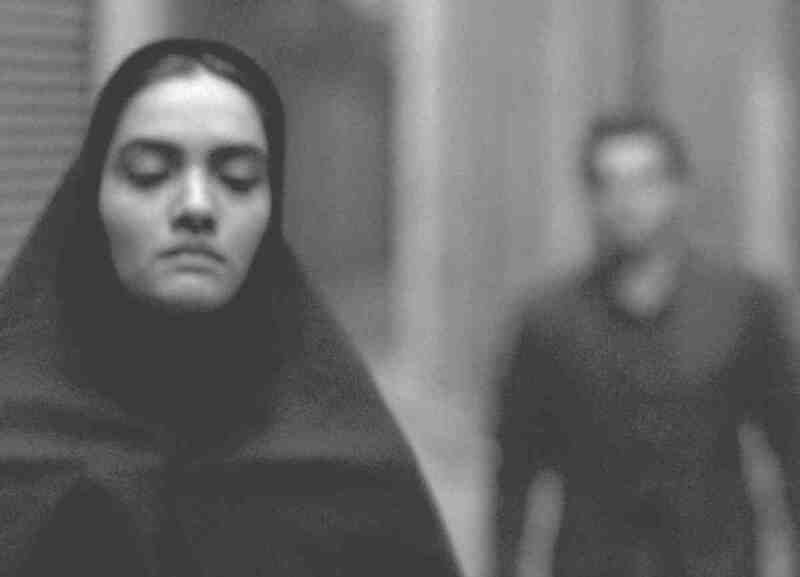 Panahi’s latest focuses on the prohibition against women attending football matches. Shot during the Iran-Bahrain World Cup qualifying match, half a dozen young women independently of each other dress as young men in order to watch the match. Their ruse fails, and they are arrested and held in a pen by soldiers, where they can only hear the crowd’s roars. It’s a witty and pertinent film which has been distributed worldwide — although Panahi’s wish that it play commercially during the World Cup may have proved a mistake, with potential audiences in the US and Europe tending to stay home to watch the football rather than his film. In complete contrast, Pitts’ Zemestan (It’s Winter), adapted from Mahmoud Dowlatabadi’s novel, is the somber story of Marhab (Ali Nicksolat), a young, unemployed man, drifting into a small town looking for work and falling in love with a young woman whose emigrant husband has been reported dead. A comment on Iran’s ongoing high unemployment, Pitts’ subtle narrative, supported by Mohommad Davoodi’s stunning photography in a bleak, snowbound landscape, features fine performances from non-professional actors, not least Nicksolat. Paris-based Pitts has produced a rewarding cinematic experience currently receiving the festival and commercial exposure it deserves. The premise of Kargaran Mashghool-e Karand (Men at Work), Mani Haghighi’s second feature, screened in the Berlin Forum, is glorious: four men, returning from a ski trip, discover a large phallic outcrop of rock hovering over a deep ravine. Immediately they set out to topple it. Based on an original idea by Abbas Kiarostami, the metaphor for masculinity at its most ridiculous (or does the outcrop signify patriarchy, which they significantly fail to dislodge?) is enchanting, and there are moments to relish but overall the film is a little stretched on content. 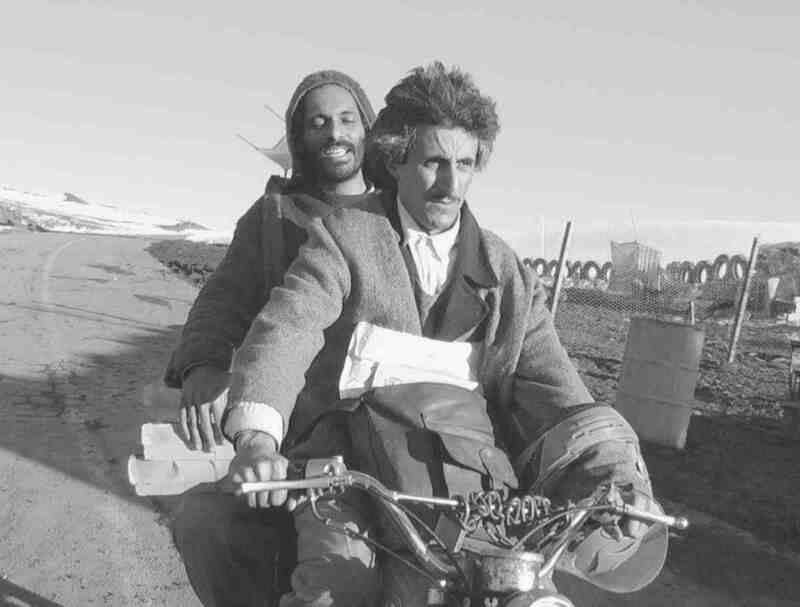 Another study of men, Chand Kilo Khorma Baraye Marassem-e Tadfin (A Few Kilos of Dates for the Funeral), shot in black and white, is Saman Salour’s surreal tale of two lost souls living in a remote, deserted gas station. A wonderfully crafted metaphor for modern life, the film moves outside the realist trajectory that has largely characterized post-revolutionary filmmaking. After Fajr, it went on to screen at Edinburgh International Film Festival and win the Cinecinema Auteur award at Locarno Film Festival. Asghar Farhadi’s Chaharshanbeh Souri (Fireworks Wednesday), an investigation of a failing middle-class marriage as observed by a young woman cleaner who is about to be married herself, also showed at Locarno. A film of good intentions, it is difficult to see it destined for an international life. A surprise addition to the Fajr program was Abolfazl Jalili’s Gol ya Pouch (Full or Empty) in which a naïve young teacher (non-professional actor Navid Raisi) arrives in a small town looking for work. Thwarted by arcane bureaucracy, he initiates a series of money-making schemes, all of which fail, as does his attempt at love. Jalili is a maverick one-man band successfully working outside the established film community. Bahman Farmanara’s A Little Kiss, features a long-exiled, ill writer, Sa’adi, who returns to Iran to see out his last days. Typically for Farmanara, the film is a lament of exile, the need to return and a metaphorical critique of the current regime. While not as fully realized as his previous films, there is much to treasure in this work by a mature artist. Following the success of Iranian films in Europe over the summer, Bahman Ghobadi’s highly anticipated Niveh Mong (Half Moon), the story of an old Iraqi Kurdish singer heading home to perform with his ten sons, made its debut at the Venice Film Festival. Ghobadi’s visual composition is stunning, and the opening scenes are playful, but this road movie ultimately loses its way. The other main festival of the fall, Toronto, bagged powerful drama Khoonbazi (Mainline), codirected by Rakhshan BaniEtemad and Mohsen Abdolvahab, which details the attempts, inevitably doomed to failure, of a young drug user to break her addiction and the overwhelming frustrations of her mother to help her. One of Bani-Etemad’s most compelling films, Khoonbazi stars her daughter, Baran Kosari, in a memorable performance. Actress-director Niki Karimi was also in Toronto with her second feature Chand Rooz Ba’d (A Few Days Later) in which she stars as Sheherazad, a woman on the verge of divorce. True to Karimi’s avowed intentions of making films outside the mainstream, the film is more concerned with Sheherazad’s internal torment and indecision in the midst of the daily minutae of her life. It is to Karimi’s credit that she manages to render this effectively. While this film may not find commercial success it’s clear that she’s becoming a director to watch. Iran became the highly successful newcomer on the international block in the late eighties. This year, it produced an unprecedented number of films traveling internationally and extended the range of subjects and genres, while largely maintaining the quality of filmmaking. Will Iranian cinema continue at this level? In his closing speech at Fajr, Iran’s Minister of Culture and Islamic Guidance, Mohammad Hossein Saffar Harandi, focused exclusively on the need for nations to ensure the vibrancy of their cultures in opposition to those “usurpers” who would subsume them. Appropriately enough, the government funded smaller, independent sales agents to attend for the first time the Berlin Festival.Clues as to what kinds of films the government might wish to see promoted, however, may lie in the Minister’s written reference to “the advancement of the country’s cinema and art in keeping with the new general movement in Iran.” We can only wait and see.